McKee* (1962) reported that about 1000 alkaloids, which are known, belong to almost 100 families, 500 genera and spread over 1200 species. However, it has been observed beyond reasonable doubt that the alkaloids are not evenly distributed amongst the plant kingdom. They have been found to be absent in Algae and in the lower groups of plants with the exception of one or two families of the fungi. 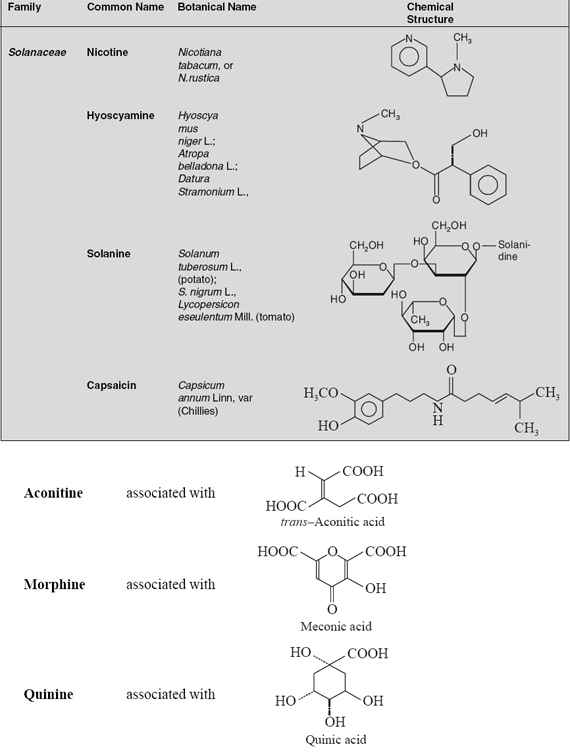 The glaring examples of fungal alkaloids include those of ergot alkaloids. The seeds of papaya, Carica papaya L. (Caricaceae), yield 660 to 760 mg BITC which is a bactericidal aglycone of glucotropaeolin benzyl isothiocyanate. However, in the plant kingdom, the alkaloids generally, seem to get confined to a certain families and genera with regard to their distribution. For instance, amongst the angiosperms the families which have been recognized as outstanding for alkaloidal-yielding plants are, namely: Apocynaceae, Berberidaceae, Papaveraceae, Ranunculaceae, Rubiaceae and Solanaceae. Monocotyledons, generally do not produce alkaloids, but investigation have revealed that two of the most promising families viz., Amaryllidaceae and Liliaceae do contain alkaloid-containing plants. Dicotyledons, mostly contain the alkaloids. It has been observed that neither Labiatae nor Rosaceae contain any alkaloid. Furthermore, almost 15% of all vascular plants contain alkaloids. Alkaloids may occur in various parts of the plant. It may, however, be pointed out that in a particular species, normally only one or two specific organs and not all organs, essentially afford the function of alkaloidal formation. For instance, the alkaloids of the tobacco plant, Nicotiana tabacum Linn., (Solanaceae), are produced in the root and are subsequently translocated to the leaves where they usually accumulate, whereas the seeds are completely devoid of alkaloid. In another glaring example the opium poppy, Papaver somniferum, the alkaloids solely occur in the fresh latex of the fruit, while the seeds of poppy are virtually devoid of alkaloids. Likewise, the colchicum** corm. Colchicum autumnale Linn. (Liliaceae), the alkaloids are found both in the seed and in the corm. Interestingly, the bark of cinchona tree, Cinchona officinalis Linn., (Rubiaceae) contain the alkaloids (viz., quinine) exclusively. In some instances, there are noticeable fluctuations in the alkaloidal content in various organs of the plant during the different stages of its growth, during different seasons, and lastly between day and night. In certain perennials, the localization and accumulation of the alkaloids in one or two particular organs, appears to be more marked and pronounced with the advancement in the age of the plant. 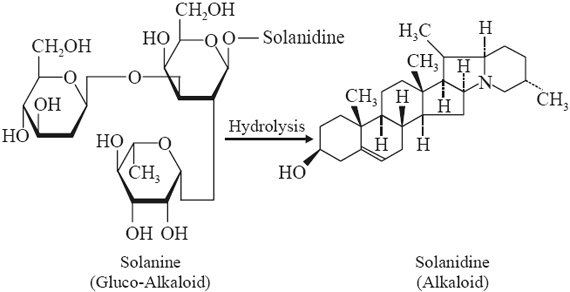 In a broader sense, the particular alkaloids of complex structures are normally confined to specific plant families, such as: hyoscyamine in Solanaceae; and colchicine in Liliaceae. More importantly, a specific family may also contain several structurally non-related alkaloids i.e., the basic-structure of alkaloids are altogether different, as examplified under. * Mckee, H.S., Nitrogen Metabolism in Plants, (1962). ** Colchicum: It is derived from Colchiss, a port on the Black Sea where the plant was first found to be growing.